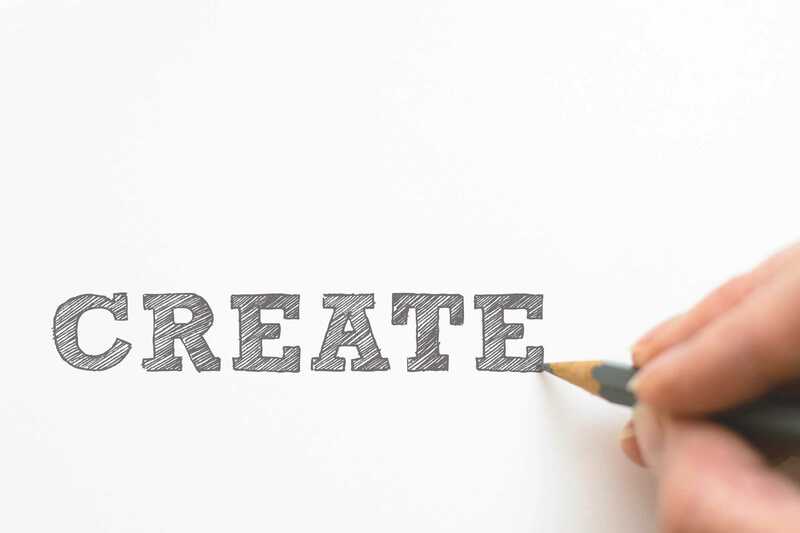 Crafting all things, big and small. I originally created this reindeer as a newborn prop for a photographer but it would make an excellent gift for any small child. 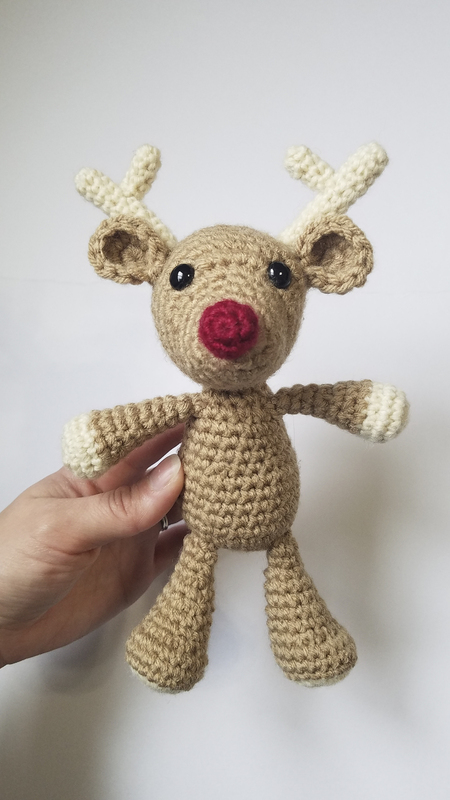 When I was creating this crochet reindeer pattern my daughter kept begging me for one of her own! Start at nose. Begin with red yarn and smaller hook. I used a 2.5mm. 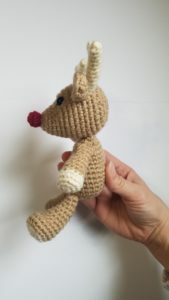 The red yarn I used was slightly thinner than the brown yarn, if you are using the same weight yarn then you can the same hook throughout but the nose will be slightly larger comparatively. Start: SC 6 in magic loop. Pull to close tightly. Stuff nose with tail from magic loop or use a little bit of stuffing if you don’t have enough of a tail. Cut red yarn. Now this is where you join the brown yarn. If you don’t care about having those little steps in the color change then join normally and continue. I prefer a cleaner look so I like to use the seamless join for the nose. There’s a ton of great video tutorials on the seamless join, it’s fairly simple and so much cleaner. Change to larger hook (3.5mm) and join brown yarn. The hook size does not matter so much just make sure you are getting a very tight gauge. Place eyes between rows 10 and 11 on each side of the set of 4 increases from row 10. Finish stuffing. Fasten off, pull tail through remaining 6 stitches tightly. Finish stuffing. Fasten off, leaving long tail for sewing head onto body. 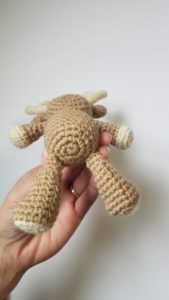 Cut yarn, join brown color and use larger hook. With smaller hook and lighter color. Start: SC 6 in magic ring. Cut yarn. Fasten off/seamless join. 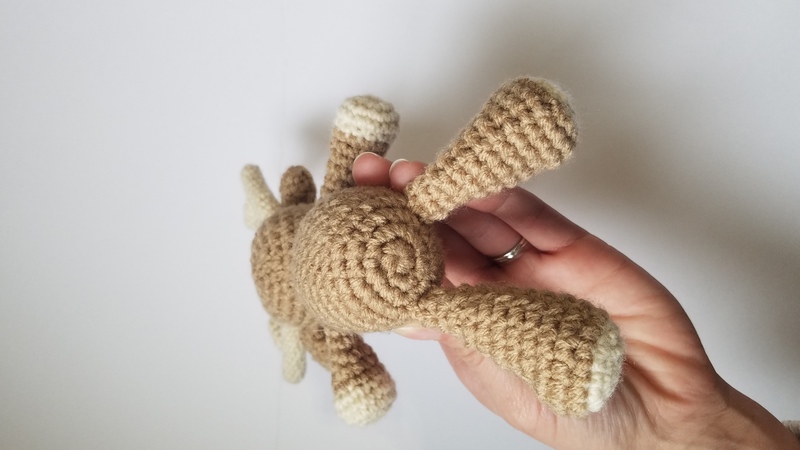 With larger hook, join brown yarn. SC 6 in magic ring, turn. Chain 2, DC twice in same stitch, dc twice in each of the next single crochets (12). Attach small part of antler to longer part. Attach ears behind eyes and antlers behind ears. Attach head to body. I like to sew the hole in the body in half and then attach to head. Attach the arms and legs to the body in the same way. Hope you all enjoy this pattern. If you have any question feel free to ask in the comments and I’ll try to answer them!